Mylohyoid ridge is an oblique ridge on the lingual surface of the lower jaw which extends from the level of the roots of the last molar as a bony attachment for the mylohyoid muscles which form the floor of the mouth. Mylohyoid ridge reduction is needed when the gum ridge is sharp and denture pressure can cause significant pain in this area. An incision is made, exposing the mylohyoid ridge. Removal of sharp bone is done with a bone ronguer in mylohyoid ridge area. Bone file used to complete recontouring of mylohyoid area followed by suturing. 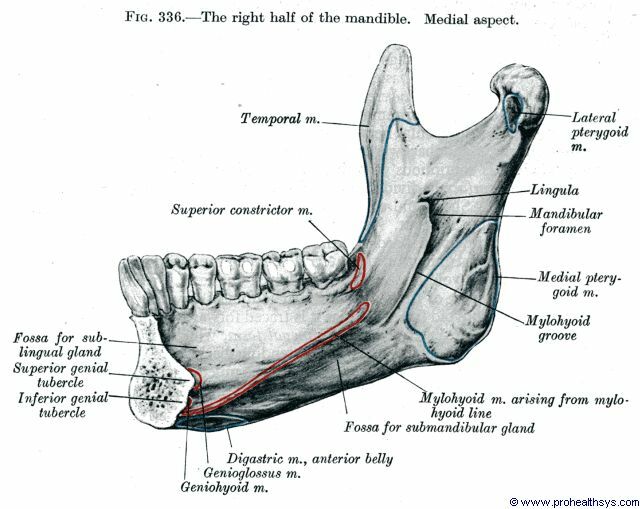 Genial tubercles are small rounded elevations on the lingual surface of the lower jaw on either side of the midline near the inferior border of the body of the lower jaw, serving as a point of insertion for the geniohyoid muscles. They can become prominent in the floor of the mouth due to alveolar ridge recession. 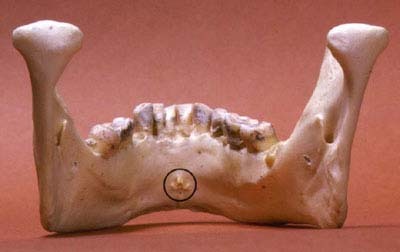 Occasionally the upper part of prominent genial tubercle may require excision to facilitate denture wearing. A frenum is a musculo-fibrous band attached to alveolus. Labial (lip), buccal (cheek), and the lingual (tongue) frenum are the most prominent. When they become prominent they lift the denture and break peripheral seal which then leads to denture instability. The extent of a prominent frenum is noted by drawing the upper lip forward which causes the base of the frenum to blanch. Local anesthesia is administrated and a diamond shaped incision is made round the margins of the frenum, deep enough to remove the excess tissue. Excision of fibrous band is done and the mucosa is undermined before suturing is done. An abnormal lingual frenal attachment usually consists of mucosa, dense fibrous connective tissue and occasionally superior fibers of genioglossus muscle. This attachment binds the tip of the tongue to the posterior surface of the lower jaw alveolar ridge. Such attachments can affect speech and after teeth loss they interfere with denture stability. A retraction suture is placed on the tip of the tongue. A horizontal incision is made at the superior portion of the frenal attachment to the inferior surface of tongue. Undermining of lateral borders of the wound margins is done before suturing. Soft tissue closure is done vertically. The primary objective for soft tissue tuberosity is to provide adequate interarch space for proper denture construction. Excessive soft tissues can lead to denture instability. Amount of soft tissue reduction can be determined by pre-surgical x-ray or the thickness can be measured with a sharp probe after administration of local anesthesia. Local anesthesia is administrated. 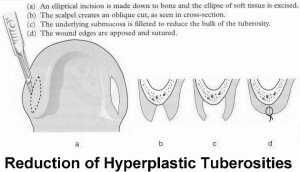 An elliptical incision is made over the maxillary tuberosity area requiring reduction. 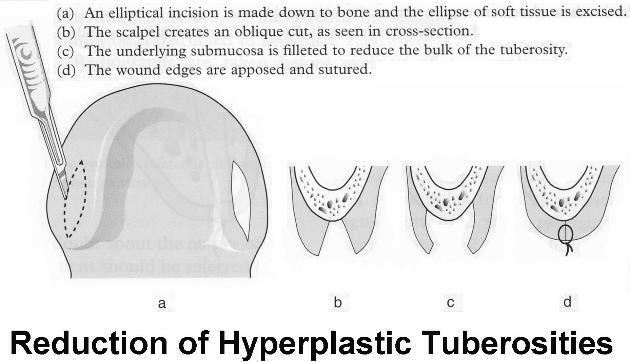 Excess soft tissues are excised with initial incision. Undermining of buccal and palatal flaps is done to provide adequate soft tissue contour and tension for free closure. After tissue removal is done, soft tissue closure follows. Denture irritation hyperplasia is a fibroepithelial overgrowth in response to chronic trauma, caused by an overextended denture flange. The condition presents as one of series of folds like leaves of books. Management includes removal of irritation (denture) by leaving out or easing flange. Review is done after one month and if hyperplasia still persists, surgical treatment is to be done. Local anesthesia is administrated. A simple excision is made, fibrous tissues removed and closure of wound margins done. Local anesthesia is administrated. Large multi-leaved hyperplasia require excision. After excision, the raw area present is covered with a split thickness skin graft. Cryosurgery or CO2 laser are alternatives. Surgical splint is placed with soft tissue conditioner for 5 to 7 days. Oral hygiene should be maintained in this period with saline rinses. Secondary epithelization usually takes place and denture impressions can be made within 4 weeks. 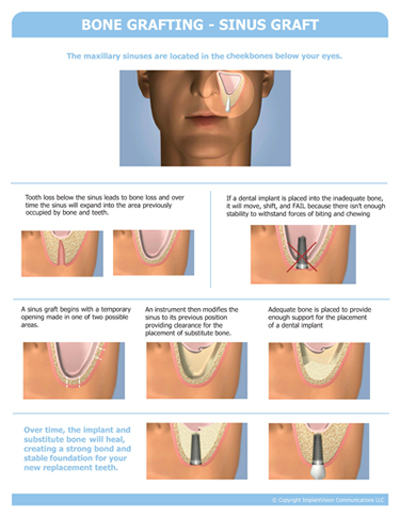 Vestibuloplasty is basically a skin graft to the alveolar surface of the jaw, creating a deeper sulcus. Bone grafting – has a disadvantage of the second surgical site which increases morbidity in the elderly. Sinus lift procedure – increasing popular procedure combined with simultaneous or delayed implants in the posterior upper jaw region. Bone graft is placed to lift the maxillary sinus lining. Bone substitutes – though this procedure avoids a second surgical site, it has poor long term success due to migration of materials. A preprosthetic component to this well-accepted technique for ‘growing’ bone by osteomizing and gradually moving bone apart (1 to 2 millimeters a day) will probably replace all major augmentation procedures. This entry was posted in Oral Surgery and tagged alveolar bone, alveolar ridge augmentation, alveoloplasty, dental implants, dentures, mylohyoid muscles, Mylohyoid ridge, preprosthetic surgery, the alveolar ridge on March 23, 2012 by oileng.